With the presence of a large pool of participants, the Global food ingredients sterilization market is displaying a highly competitive business landscape, finds a new research report by Zion Market Research (ZMR). Sterigenics International LLC, Namah Steam Sterilization, Balchem Corporation, and Napasol AG are some of the key vendors of food ingredients sterilization across the world. These players across food ingredients sterilization market are focusing aggressively on innovation, as well as on including advanced technologies in their existing products. Over the coming years, they are also expected to take up partnerships and mergers and acquisitions as their key strategy for business development, states the food ingredients sterilization market study. Citing an instance, in February 2018, Claranor, a leading manufacturer of decontamination device, developed pulsed light sterilization equipment – first of its kind- for infant powder milk powder cans. As estimated in this report, the global food ingredients sterilization market stood at US$ 339.53 million in 2017. 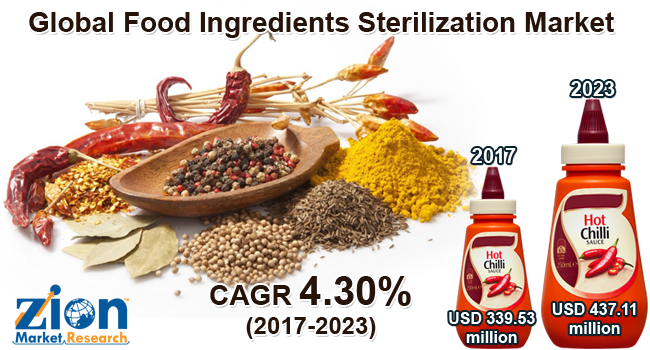 Witnessing a tremendous rise during the period from 2017 to 2023, the revenue in this food ingredients sterilization market is expected to reach US$ 437.11 million by the end of the forecast period. The main types available in this food ingredients sterilization market are spices, herbs and seasonings, dried fruits and vegetables, meat and poultry, seafood, dairy ingredients, cereals and pulses, and tea blends. Among them, the demand for spices, herbs and seasonings is relatively higher and the trend is anticipated to remain so over the next few years, notes the food ingredients sterilization market research report. “Rising contamination issues and massive demand for delivering best quality food with extended shelf life is anticipated to drive food ingredients sterilization market trends in the years ahead,” says the author of this food ingredients sterilization market study. Apart from this, strict norms pertaining to food safety has resulted in increase in the usage of sterilization equipment in food & beverages sector. In addition, innovations in sterilization technology and introduction of new food sterilizing equipment products are expected to encourage players across food & beverages industry to produce new food items. It is also likely to attract huge investments across the food sterilization equipment sector, thereby leveraging the development across food ingredients sterilization market. Low level of awareness among the consumers pertaining to benefits of food ingredients sterilization in many countries of Middle East & Africa, however, will plunge the growth graph of food ingredients sterilization market in the near future. Regionally, North America has been leading the worldwide food ingredients sterilization market and is anticipated to continue on the dominant position in the years to come, states the food ingredients sterilization market study. Enforcement of strict legislations pertaining to food safety along with growing popularity of packaged food items in countries such as U.S. and Canada is the main factor behind the dominance of the North America food ingredients sterilization market.